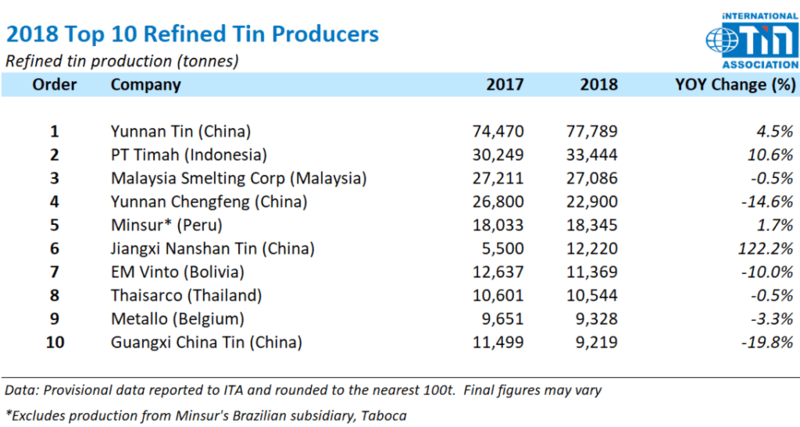 ITA reports that four of this year’s top 10 refined tin producers saw an increase in production in 2018, including three of the five biggest companies. In China, production changes were split, although the world’s largest refined tin producer, YTC, saw an increase in production in 2018. Jiangxi New Nanshan (formerly Jiangxi Nanshan Tin) shot into the top 10 with a 122% increase in production. While concentrate supply in China is tightening due to decreasing imports from Myanmar, this has not affected the largest refined tin producers. PT Timah reported a 11% increase in refined tin production to some 33,400 tonnes (unaudited) in 2018, the highest since 2011. We understand that PT Timah’s increased output is due to increased availability of concentrate following the halt to private Indonesian smelter exports in Q4 last year. This year, Indonesian production is subject to greater uncertainty due to the on-going export issues, although we believe that output will increase marginally due to PT Timah’s investment into a new fuming facility and increased CapEx for capacity enlargement. Minsur’s production in Peru increased last year by 2% to 18,300 tonnes (unaudited), from 18,000 in 2017, while its Brazilian subsidiary, Taboca, saw refined tin production fall by just over 1%. The relatively flat Peruvian production is mainly due to the performance of the company’s new ore sorting plant, which has helped to sustain production levels, despite the falling head grades at the mine. We believe that this will continue to be the case this year and expect stable production from Minsur’s Peruvian operations. Finally, in Europe, although Metallo’s production decreased by 4%, overall refined tin production in the region increased by 1% to some 13,100 tonnes.